My name is Larry Polzin and I am the owner of Stargazer Creations. I’ve been a lettering artist for over 30 years in the Sign and Graphic Design business. In 2007 I started Stargazer Creations in memory of my son, John Michael Allen Polzin. My son was an accomplished artist with a passion for botany, and wore a beautiful Stargazer Lily tattoo on his chest. I wear that flower on my chest now, over my heart, in remembrance of Johnny. Throughout my career I’ve worked in all phases of the trade: from logo development to the fabrication and installation of the finished product. I’ve had the privilege of working on many high profile projects with many talented artists and I’ve learned from the best. Some of my artistic skills are no longer practiced, though there was a time when a true craftsman did everything by hand. Times have changed, but I still have a sign kit full of paint brushes and I still know how to use them. 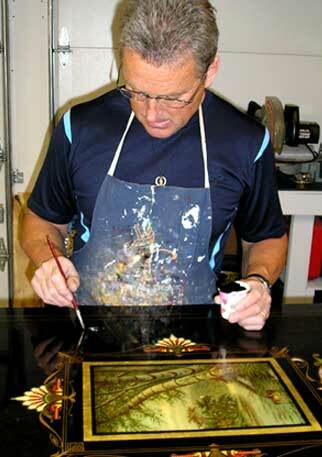 My specialties are 23K Gold Leaf and Wall Art & Murals. Both are considered “lost arts” in this age of computer generated graphics. I also work with dimensional signage and believe a 3D element always creates more visual interest. I’ve had a lot of experience in the graphic design business and have built my reputation by providing quality work to my business associates, many of whom have become close friends. If you have questions or would like to talk about a project, please feel free to contact me.